Can't locate /share/www/MT3.3/plugins/mixiSync.pl in @INC (@INC contains: /share/www/MT3.3/plugins/StyleCatcher/lib /share/www/MT3.3/plugins/spamlookup/lib /share/www/MT3.3/plugins/WidgetManager/lib /share/www/MT3.3/plugins/GoogleSearch/lib /share/www/MT3.3/extlib lib /etc/perl /usr/local/lib/perl/5.8.4 /usr/local/share/perl/5.8.4 /usr/lib/perl5 /usr/share/perl5 /usr/lib/perl/5.8 /usr/share/perl/5.8 /usr/local/lib/site_perl .) at lib/MT.pm line 618. Enable other plugins to enhance and modify the MT interface. Easy way of the duplicated post from MovableType entry into mixi diary. At first, make sure to setup the mixi user IDs onto each Authors. 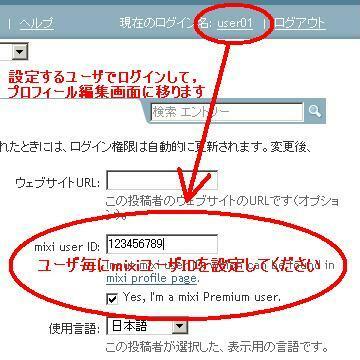 mixi user ID of yours would be found in mixi profile page.